Arriving with his lifetime companion, Lepa, on February 21st, 2016, we are his fourth and final home. Tragically, Oko, the 18 year old Leopardess did not make it to the Jungle. She was lost during a surgical procedure for a severe wound sustained from a neighboring leopard at the third home of the cats. Bo began her life easily enough. He was welcomed into the home of Steve Sipek (aka Tarzan) and Melanie Boynes. For six years he lived with Steve, Melanie and at the age of 2 years was joined by Lepa. That was until Florida Fish and Wildlife Commission launched “Project Greystoke” . Sadly, as time progressed, laws changed. 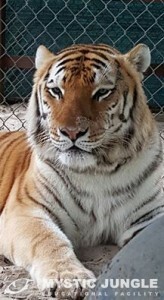 These laws were inclusive of banning private ownership of the big cats and new caging requirements. Although the FFWC had grandfathered Steve and Melanie in to keep the cats they were already in possession of, they could acquire no more and must improve the caging. For almost 2 years the battle waged on in court to get Bo, Lepa and Oko back. During this time they were held at another facility in central Florida. Finally, Steve and Melanie were awarded the cats back. The catch? Although not written nor spoken, neither would ever be able to obtain a FFWC Class I permit. No permit, no cats. Unlike Lepa, he did not fair so well psychologically. Bo arrived at the Jungle, not only terrified, but extremely hostile. The look in his eyes was one of sheer terror. Not to disrespect war veterans, but the only thing this first hand witness can akin it to is what a war veteran has. PTSD with flashbacks. I have never seen an apex predator shake as bad as he did, nor defecate on themselves. It truly broke my heart. This cat has seen a lot. In his terror he refused to even exit the transport cage into his enclosure. Having to think of a non traumatic way to get him to exit, Head Keeper Robert simply went to the back of the transport and merely drummed on the metal.. making a sound that would not harm but is annoying enough to make an animal move away from the sound. Bo calmly got up and walked out. Since that day and every day thereafter Bo has made gradual changes for the good. He senses that he is safe. Bo and Lepa are now thriving at the Jungle. Arriving scared, confused and angry, they have returned to their former days of chuffing and greeting not only Melanie, Steve but me.